My all-time favorite television show is the classic Addams Family. I’ve had an affinity for the odd, the strange, and the macabre since I was a kid, which is why I’m still obsessed with Edward Gorey. When I was a kid in SoCal I used to head up ladybug hunts in the tall grass in front of the abandoned drug house on our street. We thought it was great, like trekking through the jungle, and we’d fill up whole coffee cans with the red and black bugs. The most fun I ever had at a job was when the theater I worked at in SF was closed for 3.5 months over Christmas, and I got a job as a hot dog vendor in Union Square. Everyone thought I was crazy to love it, but I got to meet people from all over the world in the middle of the greatest city ever, and I got to wear a Santa hat to boot. And let me tell you, I worked that tip jar. Apparently I never learned to spell ‘versatile,’ because I’ve typed it about 50 times during this post and spell check keeps catching it. That’s one even I didn’t know! Versitle? Versitile? Hmm, will have to practice. I have four names. Because I didn’t take A’s name, I added it to the end of mine. It’s an important distinction. Katie is my reading idol – I don’t know how this girl goes through so many books each month. She’s the queen of lists, the claimer of all things red, and is my go-to for good tea recommendations. I was lucky enough to become friends with her when she and her man lived inAbilene, and love keeping up with herBoston adventures. I feel like I could walk around that city, just for reading her blog. I’ll admit that sometimes I avoid this blog, because Emily always seems to write in a way that cuts through the trivial, the petty, and the unnecessary, and hits me right in my gut with what it means to be God’s woman. I’ve never left her blog without feeling edified, comforted, or convicted. I followed Marisa since about a month after she started her NDaD venture. Even though her blog is focused on remaking the old and fugly into something unique and wearable, she definitely deserves this award because of how many different ways she can pull a rabbit out of a hat and make truly awful clothing look couture. You might think this is just another mommy blog, but Adelle writes with passion about everything she loves, including (but not limited to) being a Boymom. From the tongue-in-cheek to the beautifully lyrical, this lady writes it all, and does it while wearing great shoes. The only tumblr account I follow, this gal knows how to do glamour! She posts great photos of whatever catches her eye, and I love seeing her perspective of the world through her lens. If you ever need a personal style consultant, give her a call. So that’s it! Thanks again to Cara and This Little Light for kicking this off. 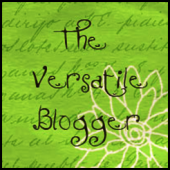 Now I want to know, who would you give a Versatile Blogger Award to? I just may do that one of these days! wow – “beautifully lyrical”? Wow! (And today it’s bronze Andrew Gellar wedges) Thanks Christy! I love those shoes! You, my dear, are one classy lady.